Here's every Vishniac or Vichniac that I know of on the Internet, just in case you're looking for some other one than me. If you know of another Vishniac who's not listed here, please tell me. You can contact any living family member mentioned here by sending mail to them at vishniac.com. Each family member's username is their first name, shown in bold print on this page. The name is a variant of Wishniak, or Wisniak. Our family adopted the name in the early 19th century while our ancestor, Eliezur Elimelech Vishniak, was living in the town of Bielsk-Podlaski, Poland. Within our family it has been spelled as Vischniac, Vishniak, and even Wischniak. The original spelling is unknown, but it appears on the tombstone of one of Eliezur's sons as (vav-vav-shin-nun-yud-koof). My wife Kathy (nee Kathleen Kohl) runs our house and teaches nursery school. Our older son David recently graduated from Franklin Pierce University and is heavily into sports. Jordan goes to Arlington High School and reads voluminously. My brother, Ethan Vishniac, formerly of The University of Texas at Austin and Johns Hopkins University, now teaches at McMaster University. His wife, Ilene Busch-Vishniac, was Dean of Engineering at Hopkins and is now provost at McMaster. My mother, Dr. Helen Vishniac, is an emeritus professor of Microbiology at Oklahoma State University. My father, the late Wolf V. Vishniac, has a Martian crater named in his honor. Vishniac crater is just below the center of this picture, and is the larger and more southerly of the two adjacent craters known as the "Giant's Footprint". Vishniac crater is an important location in Kim Stanley Robinson's novel Green Mars. 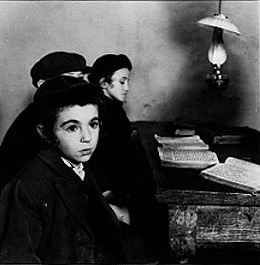 My grandfather, the late Roman S. Vishniac, is best known for his photographs of European Jewish life before World War II. Many of these pictures are collected in "A Vanished World" and "To Give Them Light". Copies of his photographs can be acquired through the Howard Greenberg Gallery in New York City. There's a brief biography on encyclopedia.com and a longer biography in Wikipedia. You can find many of Roman's books on amazon.com and on barnesandnoble.com. Roman's cousin Mark Veniaminovich Vishniak was very active in politics circa the Russian revolution. Indiana University has some of his correspondence in the Lilly library. If your spelling's a bit off, you might be looking for our cousin, Gerard Vichniac, or Gerard's wife, Judy Vichniac, who works at Harvard University. Their children, Avi and Rebecca, are also reachable on-line. Peter S. Vishniac, no relation to any other Vishniac mentioned here, worked at the University of California San Francisco. I haven't heard from him in several years and can't find any sign that he's still there. Floyd Wayne Vishniak, no relation to anybody, is a fictional character in pseudonymous Stephen Bury's cyber-something novel Interface. Ephraim's Home --- Every Ephraim --- Comments? Questions?